Do you zip through airports with an umbrella stroller like a boss? Well, you can now protect that compact stroller from dirt and germs when you gracefully pull out the Gate Check Bag for Umbrella Strollers and slide it over the stroller with ease. Our bright red Gate Check Bags have been parent’s go-to travel bag for over a decade and for lots of good reasons. This durable, yet lightweight bag fits and easily covers most compact, umbrella-style strollers and features a drawstring closure with adjustable lock. 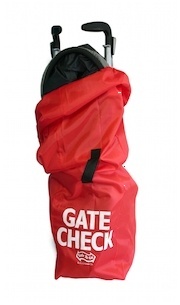 Once you’ve put your stroller inside, simply hand over your bag at the airplane gate and you can rest easy knowing that the durable fabric, bright red color and large GATE CHECK logo will ensure that your stroller is protected and safely returned to you at the end of your flight. The Gate Check Bag stuffs quickly into it’s attached stretch pouch and easily fits into your carry-on bag or stroller storage basket. With a webbing handle for easy lifting, reinforced seams for strength and a personal ID box for quick identification – you can focus on packing snacks and the iPad because we’ve got the stroller covered! You can also use this as a storage bag for your strollers (or any of your other stuff that now resides in your garage or closet).